Harold Cooper: Ranko Zamani's been dead for six years. He's a non-existent threat. Raymond 'Red' Reddington: Then a dead man just stepped off United 283 from Munich to Dulles. Q: Is "RED" Keen father ? 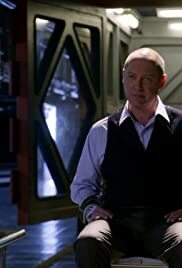 The Plot: x-government agent and one of the FBI's Most Wanted fugitives, Raymond "Red" Reddington (James Spader) mysteriously turns himself in to the FBI and offers to give up everyone he has ever worked with including a long-thought-dead terrorist but under one condition - he'll only talk to newly-minted female FBI profiler, Elizabeth Keen (Megan Boone) with whom he seemingly has no connection. For Liz, it's going to be one hell of a first day on the job and what follows is a twisting series of events as the race to stop a terrorist begins. I REALLY wanted to like this show because of all the buzz. James Spader is very good,but the female lead is over her head. She's a weak actress who brings the action down. Further, the story line is very derivative reminiscent of Homeland only not as good. And Spader is very much a throw back to Silnce of the Lambs without the fava beans and liver. The show is also rather amateurishly directed. I'm reviewing the pilot but will be giving a few more episodes a try.